Now it is time to go railroading in Europa. Just like Transamerica, players work together building a railroad network, but this time it is across Europe instead of the United States. The first to have their five cities connected winds the round - the others lose points for being too slow! After 3-4 rounds, the player with the most points wins the game! 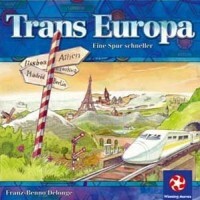 Add a Review for "Trans Europa"